The following email was recieved from a Mr. J. P. Smith with information about E.B. Wise, the maker of Chairs in Bottles. "This is a picture, obviously, of a chair-in-a-bottle, made by E. B. Wise. The bottle belonged to my mother, a Muckleroy of Nacogdoches, Texas. Exactly when and how it came into her possession, I do not know. When she died in 1957, I brought it home with me. In 1996, I began doing the family genealogy and became curious about the origin of this bottle. The newspaper in Nacogdoches was kind enough to run a general inquiry article as to the local origin of the bottle, but there was no response. I found it hard to believe that there was only one of these chair-in-bottles in existence. On Friday evening, October 21, 2005, I received a phone call from a Mr. Greg N. Alvey of Owensboro, KY. He had found on the internet a posting I had made several years ago seeking information on the maker, E. B. Wise. Mr. Alvey is a collector of folk art and told me he had a bottle like mine that he had obtained in San Antonio, Texas. While on the phone, we exchanged photos of our respective bottles via the internet and it was quite obvious that the same person was the creator of this folk art. Who made this bit of art? Inscribed in pencil on the upper stretcher between the two rear upright posts is the following: “Made by E. B. Wise, 1934"; on the lower stretcher is inscribed: “”; on the rear of the lower stretcher is inscribed: “5/30/34". A search of the 1930 U. S. Census records of Nacogdoches County, Texas does not turn up a E. B. Wise., although there are four other Wise’s enumerated. He is also not found in the counties adjacent to Nacogdoches. The Bottle: In my opinion, this bottle originally was a patent medicine bottle, machine made, using a stopper instead of a screw cap. The bottom of the bottle has a circular, concave shape, 1.5 inches in diameter and .25 inches upwards. These words are shaped into this circular area: “U. S. LA Co. PATENT APPLIED FOR”; the number “5" is also inscribed within the circular area of the bottom. 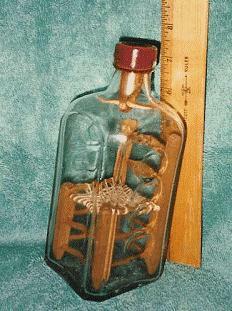 The bottle is 7.5 inches tall, 2.63 inches square and weighs about one pound. The sides of the bottle adjacent to the sides of the chair, has four one inch vertical circles that appear to be finger holds to facilitate holding the bottle. Although the bottle is square in shape, the vertical corners are angled off at 45 degrees to each of the four sides. The stopper for the bottle appears to be shaft of wood, 2” x 3/4 “. This wooden shaft is tapered and has a retainer positioned at 90 degrees to the shaft in such a fashion that precludes the shaft from being withdrawn without destroying the bottle. The Chair: The chair is a light brown colored wood, but I do not know what type of wood was used by Mr. Wise to make this chair. My guess would be either pine or cedar since both are quite common in East Texas. The vertical front and rear of the chair is held together on the bottom of the chair by a total of twelve, toothpick like, horizontal pieces, three on each of the four sides. The rear vertical of the chair is held together by the two wooden pieces that are inscribed. These are about 2” x 3/8”, wider in the middle and tapering to the sides of the chair. The seat of the chair is woven with a light beige colored string. In the right rear corner of the seat of the chair can be seen the knots Mr. Wise tied for the beginning and the ending of this string seat. Looking at the seat weaving from the front, there are 9 doubles and one single weaving; there are 8 single weaving from side to side of the chair. See picture - note the knot in the right rear corner."